Social Skills Group - Darnyl R. Katzinger, Psy.D. Dr. Katzinger offers social skills groups aimed at increasing functional social skills that a child can use in everyday social settings. She utilizes a cognitive behavioral approach, which has the vast majority of research supporting its effectiveness in children with social skills deficits. Groups focus on reinforcing positive behaviors such as following instructions and routines, functional communications skills, and positive non-verbal communication skills such as eye contact and empathy. A social skills checklist will be given to significant adults in the child's life to determine specific deficits and intervention needs as well as at the end of a twelve-week session to track progress. Suggestions from parents are welcomed. 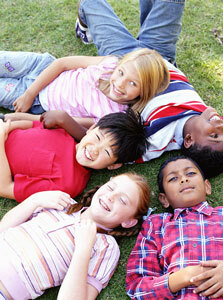 Groups are typically divided by age: 7-9 year olds and 10-12 year olds and are limited to six children. Adolescent groups may become available in the future. Children will be registered on a first-come, first-serve basis. Groups run in twelve-week sessions with one skill covered per week. Each session will run 90 minutes and will concentrate on a different skill. Each session will include talk time, skill time, game time, and snack time to allow the children to incorporate some of the skills learned during the lesson. Please send a drink and a small snack with your child to each session so they can participate in this activity. Homework is assigned to increase the generalization of skills beyond the group session. The group operates as a closed group, meaning new members can join every twelve weeks. Participants are encouraged to attend all twelve weeks, as each session builds upon the previous session. In addition, participants can be re-enrolled for another twelve-week cycle upon completion of the first. New skills will be taught at that time and those with which children struggle will be reviewed. Children with high-functioning autism, Asperger's Disorder, and ADHD are welcome to join. Because Dr. Katzinger is a licensed clinical psychologist, certain insurance companies may cover these services. Please contact me at (404) 909-9500 for further inquiry or to enroll your child. New groups will be starting soon.